Scientific name: Omphisa anastomosalis Guen. The stemborer is one of the most destructive pests of sweetpotato in tropical and subtropical Asia and the Pacific. Infestation during the establishment phase of the crop can result in yield losses of 30-50% or more. Generally widespread in the Philippines, Indonesia, India, Sri Lanka, Malaysia, Taiwan, Hawaii and Vietnam. It also occurs in China, Japan, Cambodia, Laos, Burma (Myanmar), and Thailand. 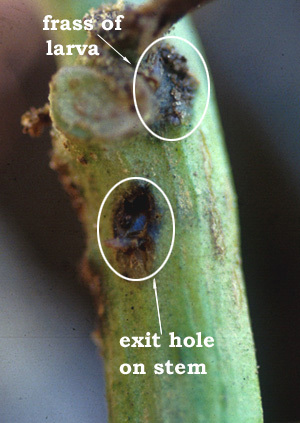 The larva bores into the main stem and sometimes penetrates the storage roots. Larval feeding produces large tunnels causing hollow cavities in the stem resulting in wilting and eventual death of infested plants. Attack at early stages of plant growth prevents storage root formation since translocation of food and its storage in the roots become severely affected. Further damage occurs when the larva tunnels into the storage roots making them non-marketable. Infestation during the establishment phase of the crop can result in yield losses of 30-50% or more. Infested plants usually have a pile of frass that can be found close to the attacked stem. Egg.The flattened yellow, oval eggs are laid in groups of 2 or 3 in crevices on the stem, or on the lower leaf surface around the margin or in single row of 6 or more eggs along the midrib of the leaf. Larva. The newly-hatched larva has a reddish tinge on its body and black head. After few days, it turns yellowish with blackish markings on both the dorsal and lateral sides of the body. Setae (bristles) are brown and sparse becoming more noticeable as the larva matures. The full grown larva reaches 33 mm in length. Pupa. The obtect pupa is brown. Adult. 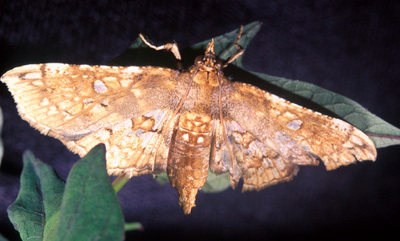 The adult moth is 15 mm long, has a wingspan of 33 mm, with a reddish-brown body and reddish brown markings on the white wings. The larva emerges after an incubation period of 3-8 days. There are five larval instars with a total developmental period of 12-50 days. Before pupating the larva makes an exit hole that is covered with the epidermis of the stem. Pupation last about two weeks and takes place in a web-covered cocoon within the tunnel. The adults emerge by breaking through the dry papery covering of the exit hole. They live for 5 -10 days. The total life cycle ranges from 22-30 days. The females lay an average of 150-300 eggs. Sweetpotato stemborer also lives on another Convolvulaceae - Ipomea pescaprae (L.). 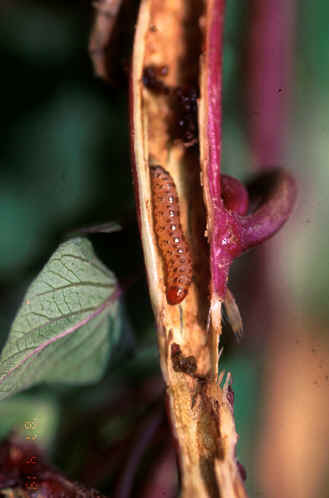 Using planting materials infested with stemborer eggs or planting a new field next to an infested one are often the main means of disseminating this pest. Treatment of planting materials and crop rotation are good means of controlling the pest. Hilling-up is effective when the holes that provide the adults with an exit from the stem are covered with soil. Earwigs and ants may attack the larvae developing within sweetpotato vines. Undetermined hymenopteran species (family Encyrtidae) have been observed attacking this pest. Sources of resistance have been identified by the Asian Vegetable Research and Development Center, Taiwan. Amalin, D.M. and Vasquez, E. A. 1993. A handbook on Philippine sweet potato pests and their natural enemies. International Potato Center (CIP), Los Baños, Philipppines. 82 p.
Ames, T., Smit, N.E.J.M., Braun, A.R., O’Sullivan, J.N., and Skoglund, L.G. 1996. Sweetpotato: Major pests diseases, and nutritional disorders. International Potato Center (CIP). Lima, Perú. 152 p.
PANS. 1978. Pest Control in Tropical Root Crop. Manual No. 4. Center for Overseas Pest Research. London. 235 p.
Vasquez, E.A. and Sajise, C.E. 1990. Pests of sweetpotato: Insects, mites and diseases. Philippine Root Crop Information Service, Philippine Root Crop Research & Training Center. 65 p.
Swelling and woodiness of the lower stem (J. O'Sullivan). Stem hole made by stemborer larva (A. Braun). Stemborer larva inside stem (A. Braun). 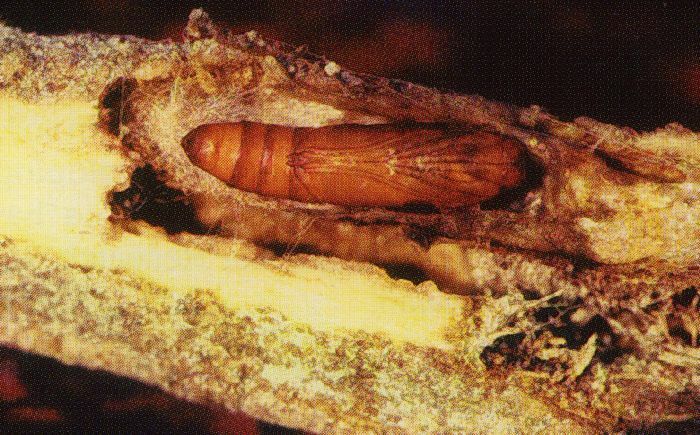 Stemborer pupa in a stem cavity (A. Braun). Stemborer moth on a leaf (A. Braun). 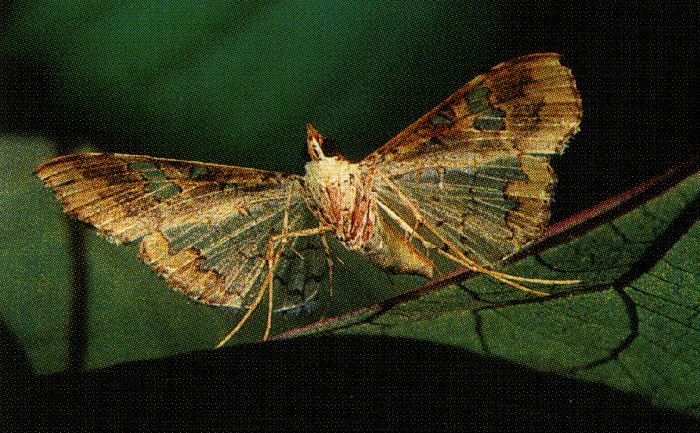 Dorsal view of a stemborer moth (A. Braun).